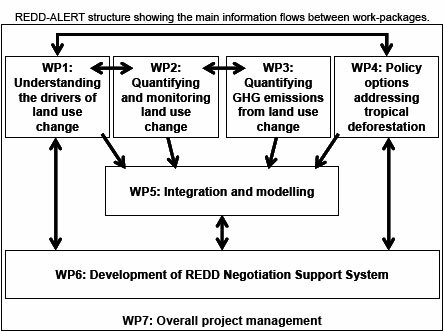 The REDD Alert project is organized into six key research activities, also called work packages. The first three of these work-packages (WP1, WP2, and WP3) build on the work conducted by the ASB Partnership for the Tropical Forest Margins in landscapes representing the global range of drivers. ASB has generated over a decade of livelihood and spatial analysis and direct engagement with all relevant stakeholders at local and national levels. These will provide the basic underpinning social, cultural, economic and biophysical knowledge which will be integrated in subsequent work-packages. WP4 is based on active participation in REDD discussions in UNFCCC fora, and will consider how proposed REDD policies can be translated into national-level instruments and mechanisms to help reduce rates of deforestation, and how these might be incorporated into the post-2012 successor to the Kyoto Protocol. WP5 will attempt to integrate the social, economic and biophysical knowledge from WP1, WP2, and WP3 into robust IPCC Agriculture, Forestry and Other Land Uses (AFOLU) Tier 2/3 accounting models and spatially-explicit coupled human-environment (CHE) models to use as tools to evaluate the efficiency or otherwise of policies proposed in WP4. WP6 will use simplified versions of these models together with participatory approaches with stakeholders to develop a set of negotiation-support tools that will contribute towards potential conflict resolution and equitable distribution of potential benefits from the policies being proposed and evaluated. It will also contribute to all of the other WPs by improving understanding of public beliefs, perceptions, attitudes and preferences regarding deforestation and its consequences for GHG emissions and climate change.